Summer is the time to catch up on all house renovations, and our house still needs lots of nurturing. The problem is (besides money) time is going by so fast. I have put in some flowers and bushes, but it feels like just a drop in the bucket. 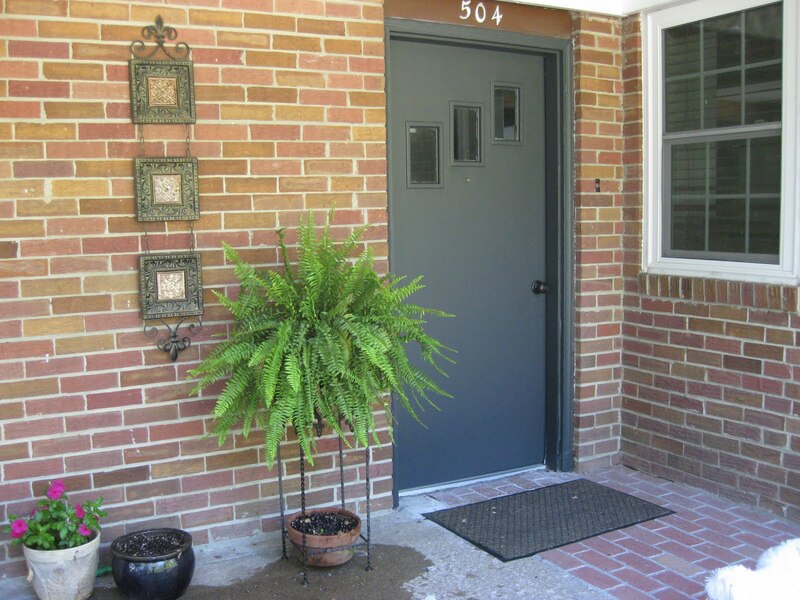 We have some curb appeal issues, but most of them are just not in the budget for now. Remember we are "CRUSHING our debt" right now. But that is another story. Paint is the answer. Painting is like vacuuming. 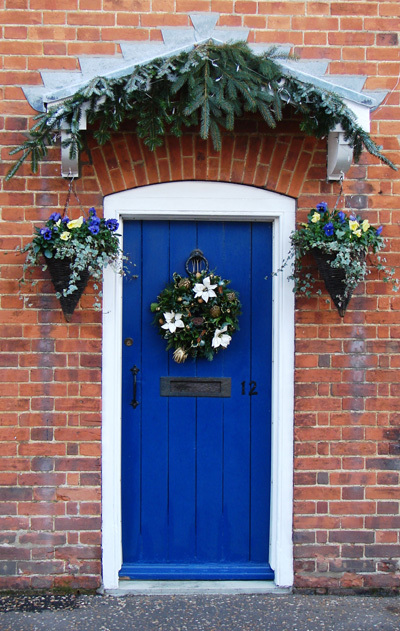 For a relatively small amount of effort it gives instant newness. And I love to vacuum! 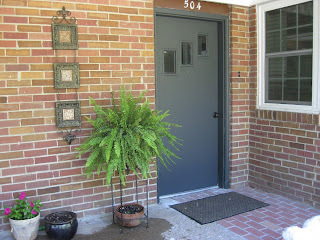 Last year was the beginning of the "what-color-to-paint-my-very-ugly-door" dilemma. 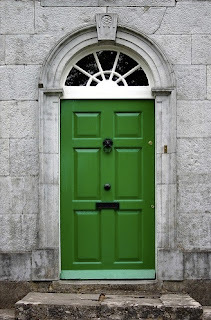 I found adorable pictures of doors with wonders of color! 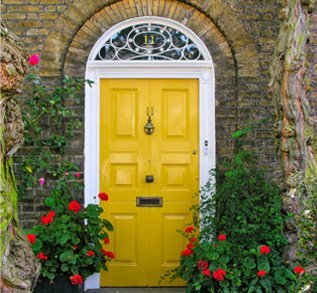 i love this yellow door! The problem I have is that my actual door is so messed up and simply ugly. Really! It is cut off at the bottom crookedly, and it is just a plain flat slab door. If I paint it such an eye catching color it will draw attention to a detail that is better off being part of the whole picture. After much deliberating last year I ended up with a nice white. It is a safe color. I like safe. A year later our door has gotten scratched and scuffed, and it needed a little help. One thing I didn't like about our door being white is that at night it would attract a lot of bugs and then they would fly in our house when we opened our door. It is GREY! (I have always preferred this spelling) I like it! The paint I used is not an exterior paint, so I will eventually have to get the correct kind of paint and give it another coat. The door is not in direct sun nor does it get rained on, so it will be ok for now. 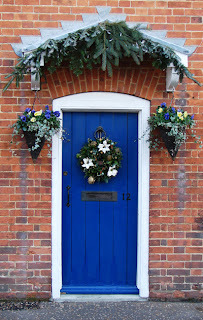 I had to make sure I was going to like it, and I had the RH Flint paint on hand. 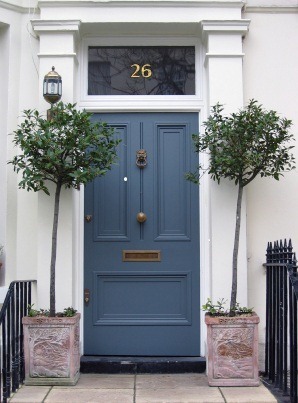 Someday, when we have a beautiful door, I will pick a stunning color. But until then, our door looks better in a nice understated charcoal grey. 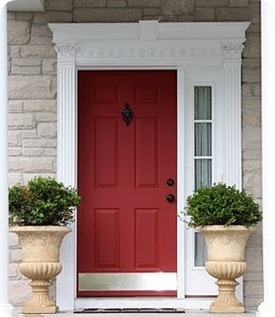 I like the new door color, it adds character. love it! Your blog looks great as well. You probably changed it a long time ago and I am just now getting to check all my favorite blogs! ...I have always preferred that spelling too. It's Canadian, after all:-) Go Grey!